Due to the success of the site in Bescot Walsall, we are pleased to announce we have now opened a further branch in Wednesbury. We have a range of 10ft,20ft and 40ft containers available. Prices range from as little of £15.00 per week. Suitable for document storage, business and domestic storage. We also offer storage of caravans for as little as £12.50 per week. With valet service available if required. 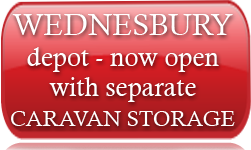 For more information on our range of self storage services covering the Wednesbury area call NOW on 0121 505 2378 anytime day or night, and we will be pleased to give you a competitive quote.